I can tell she’s upset before she opens her mouth. She isn’t the type of person to keep things in, so I don’t have to wait long after she plops her purse down and sags into the desk chair across from me before she starts talking. 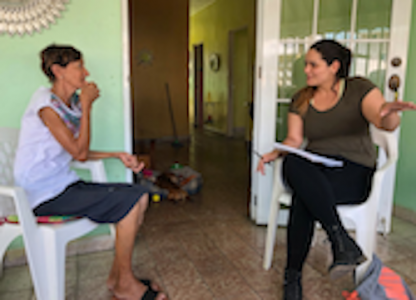 Maria on a recent reporting trip to cover Latinx populations in Puerto Rico. They just don’t understand, she says. Nobody from outside Venezuela knows what it’s like there. María pulls an edition of the campus newspaper, The Daily Tar Heel, out of her bag in the dark basement room of our Documentary Multimedia Storytelling class. She flips the paper over to show me a column titled, “The market and its discontents” by a student contributor. The article criticizes market capitalism and proposes an alternative, centrally planned “anarcho-syndicalist economy,” in the United States. It’s written by a student with a minor in philosophy, politics and economics who has written articles with a socialist slant before. This isn’t the first time she’s encountered pro-socialist sentiments on campus. These viewpoints certainly don’t echo those of the campus majority. Nevertheless, Chapel Hill is known as a spot of baby blue in a state that leans red, and the student body at the University of North Carolina at Chapel Hill tilts decidedly left. She’s seen the student chapter of the Young Democratic Socialists of America recruit members around campus. She’s read similar columns in the Daily Tar Heel, a paper for which she covers the University beat, echo the same tired maxims — capitalism is exploitative, they write. Socialism gives people a voice. María finds it strange that some people around campus, whom she sees as having grown up with a stable government and a fairly prosperous economy, advocate for a socialist government. They’ve never needed anything or depended on anyone, as far as she can tell. The students who champion socialism haven’t seen Venezuela’s spiral into corruption and poverty like María has. She was born in Caracas and spent the first 15 years of her life there. 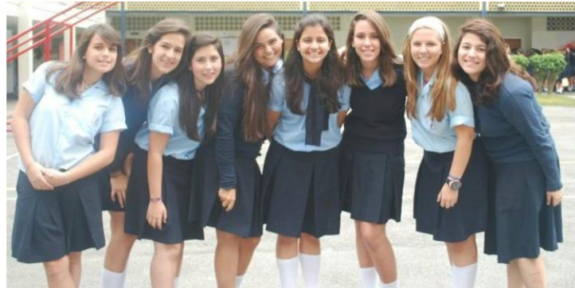 Maria, at 14, with a school group in Venezuela. While María was starting a new life in Miami and later in Chapel Hill, she worried about her mother and grandparents still living in Venezuela. She feared for their safety in an increasingly unstable country where violence was increasing. Her family was on vacation one weekend when a group of men broke into their apartment complex. While María’s family got lucky and had nothing stolen, others in the building had TVs and money stolen and their car windows smashed. María’s mother owned an empanada shop, and though nobody tried to rob her store, she was behind the counter when someone entered the store and held a gun to a patron’s head. Food shortages were a fact of life. Everyone in the family home drank a different kind of milk because it was one of the food staples that was constantly in shortage. Her grandfather drank powdered regular milk, her grandmother drank powdered skim milk and María drank liquid skim milk. María’s mother and grandparents moved to Bogotá, Colombia, in February. She still has friends in Venezuela. Many are looking for ways out of the country. 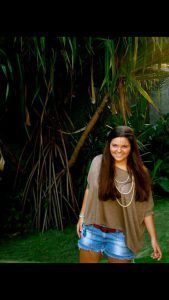 Maria, at 19, in Miami. voted Republican. María remembers going to a Democratic presidential debate at Miami Dade College and hearing candidate Bernie Sanders’ praise of Cuba’s health care system flop with the audience. In Chapel Hill, people just don’t understand, she thinks. It’s not solely an issue of political differences, but of cultural and social differences. Chapel Hill’s Latino population is significantly smaller than Miami’s, and María finds it hard to find people who relate to her experiences as a Latinx immigrant, much less one from Venezuela. She frequently gets mistaken for Mexican or Central American, two Latino groups who are more common in Chapel Hill. Being Venezuelan is an intense source of pride for María. So is being from Miami. It’s this intersectionality of her identity that confuses others, especially when people want to make her Venezuelan identity political. She feels that she can’t identify as herself without being stereotyped — she’s either lumped in with other Latinx immigrants and their experiences or she’s pitied or questioned for being Venezuelan. Others won’t permit her to appreciate and celebrate her identities, so María has stopped asking permission.